NetSetMan for Windows 10 quickly creates, administers different types of network connections. You can manually or automatically adjust the parameters. Online generation of connections with various characteristics is available, without resorting to standard OS tools. The program is in demand for use on portable devices. The utility will display data about what the current IP settings are, user privileges. Implemented support for management options when using the command line. You can create up to six profiles, each of which will have different settings. 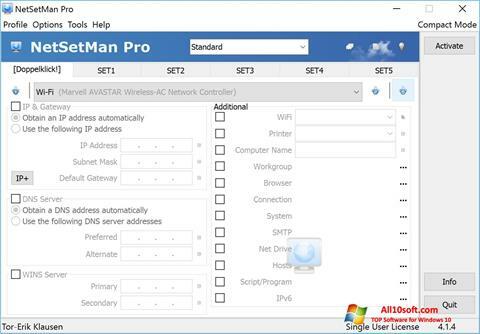 You can free download NetSetMan official latest version for Windows 10 in English.